Japan’s normal winter pattern is to have a high pressure system in the west, and a low pressure system in the east. Typically cold northwest winds blow in from the Asian continent over the Sea of Japan, producing snow clouds as they meet the warm water of the Tsushima current, and bring heavy snowfall along the Sea of Japan. Sometimes violent lightning occurs in Japan in the winter. Japan experienced an unusually cold winter and high snowfalls in 2005-2006. The unseasonably frigid temperatures were attributed to El Nina, which disrupted Japan’s normal westerly wind patterns, strengthening the southerly flow of cold air. Japan experienced an unusually warm winter in 2006-2007. Golf courses welcomed the change while other places didn’t. Some winter festivals had to truck in snow. Some ski resorts filed for bankruptcy. The unseasonably mild temperatures were attributed to El Nino, which produced warm temperatures near the equator that disrupted Japan’s normal winter pattern of a high pressure system in the west, and low pressure system in the east, blocking the southerly flow of cold air and allowing warm air to come in from the south. 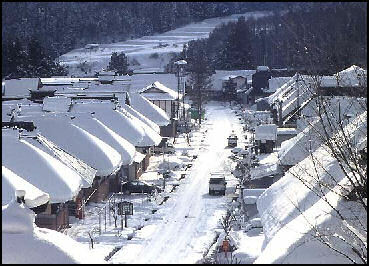 heavy snow in 2005 In winter, winds and precipitation coming from the west across the Sea of Japan often brings heavy snows to northwest Honshu. Snow country refers to an area between the Sea of Japan and the Japanese Alps. It is one of the snowiest regions in the world, with snow levels measured in meters rather than centimeters or inches. Precipitation-laden clouds coming in from the Sea of Japan bang up against the mountains and drop huge loads of snow. The town of Tsunan, which lies in the heart of snow country, was buried under seven meters of snow in 1945. Until these areas were regularly plowed starting in the 1960s, some places were virtually cut off from the rest of the world until the snow disappeared. Cars and houses are buried under snow. Towns became lumpy white blankets. Streets that are plowed are lined by walls of snow. Some people have to climb out of second-story widows onto three-meter-high walls of snow just to get out their house. Kids play jump rope by jumping over power lines. Snow has to be cleared from roofs to keep them from collapsing. Typically the man of the house climbs a ladder to the roof to clear the snow while his wife waits below. These days many of the people who live in rural areas with lots of snow are people in their 70s and 80s. Many of them have gotten hurt or even died from falling off roofs or being knocked out or buried under falling snow. People have also died when heavy snow on roofs caused entire buildings to collapse. Some places with heavy snowfalls have sprinklers in the middle of the streets and electrical pumps that use mildly warm underground water to melt the snow. Some streets, especially those around the train stations, are heated. Large chunks of local budgets are spent on snow removal. Heavy snowfall in late 2005 and early 2006 resulted in more than 60 deaths and 1,178 injuries. 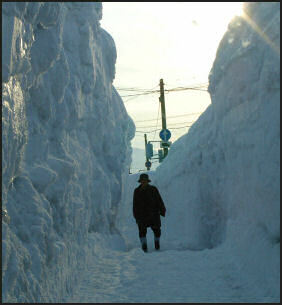 Places in Niigata and Nagano received more than 80 centimeters a day. Tsunan lay under four meters of snow in early January. Many of those who died where elderly people who fell while shoveling snow off the roofs of their houses. Snowfall amounts were so high in 2006 that ski resorts and onsens lost customers because of fears by customers over avalanches, Some places received so much snow that the military was called in to help remove it. By the time winter was nearing its end some places had accumulated more that six meters of snow. The record snows were accompanied by the coldest temperatures since the mid 1980s. Some of the same areas that get by record snows also endured power outages caused by heavy snow and ice on power lines. Power lines from nuclear plants were damaged, causing the nuclear plants to shut down. Trains were also shut down. The walls of snow in 2,390-meter-high Yuki no Otani (“Great Snow Valley”) on the Tateyama-Kurobe Alpine Route between Toyama and Nagano prefectures were up to 19 meters high when the route was opened in April in 2006. The Hokuriku region of Niigata, Fukui and Tottori prefectures got hit by unusually heavy snow---up to four meters as of mid February--- in the winter of 2010-2011. The harsh weather was particularly tough since many of the residents of the area are in their 70s and 80s. An 87-year-old women whose house had snow up the second floor balcony and told the Yomiuri Shimbun, “It was difficult to get out.” When she passed by other house she made a point to stay some distance away so she wouldn’t be buried by a sudden rooftop avalanche. Some houses had snow tunnels to reach their front doors and required lights to be on the daytime as snow covered all the windows. Numerous greenhouses were crushed. As of February 19th 2011, 96 people had died in snow-related accidents in snow-related accidents in 13 prefectures, with 19 in Niigata and 15 in Hokkaido. Sixty people were killed removing snow, many of them from rooftops, Snow sliding off roofs and other places, burying people, killed another 12. On top of that, 971 were injured in snow-related accidients. From December 2005 to March 2006 152 people died in snow-related accidents. A cold air mass in November brought snow to tropical Amami-Oshima Island near Okinawa and shut down overnight trains and delayed more than 3000 local trains on the main islands of Japan. Record low temperatures were recorded in a number of places. A record 192 centimeters of snow accumulated at Kitahiroshimacho in Hiroshima Prefecture . More than three meters of snow piled up in Sukayu hot springs in Aomori Prefecture. Lots of Japanese winter hikers, climbers, skiers and snowboarders die every winter in avalanches. In January 2008, four climbers died on 3,180-meter-high Mt. Yarigatake in Takayama, Gifu Prefecture after being engulfed by an avalanche around midnight. The four were with a group of seven that were camped in tents on the mountain. Snows of up to three meters were reported and avalanche warnings had been issued. In November 2011 five skiers were engulfed by an avalanche in the Tateyama area of the Northern Alps. Two of them died. In December four people were killed by an avalanche at a ski resort in the Okudaisen area of Tottori Prefecture. A total of 78 people died in avalanches in the 1990s, 85 percent of them pursuing a winter sport such as skiing or climbing snow-covered peaks. Two avalanches on March 22, 1982 killed 16 people in 24 hours. In May 2006, three people were killed---one male and two female climbers---and two were rescued in a avalanche near 2,821-meter-high Mt. Harinoki in the Nagano area. In November 2010, a skier was killed and four others were injured in an avalanche in Tateyama-chi in Toyama Prefecture.